Without a doubt, a Melbourne to Brisbane backload is the most affordable way to move home or office furniture from Melbourne to Brisbane. The Backloading Company are expert furniture movers. Specialising in the handling, loading and unloading of furniture from Melbourne to Brisbane. Organising and planning your move to make your life easier. Backloading is the best way to move from Melbourne to Brisbane. Using a company like The Backloading Company will ensure you save time and money on any interstate move. If you are moving from Melbourne to Brisbane you are probably facing this problem – there is almost 1,700 km between the two places. We have a solution that is sure to benefit you with time and dollars. We provide an interstate removal service from Melbourne to Brisbane each week. Melbourne to Brisbane Backloading is a very established process, especially in Australia where long distance transportation of furniture is not a piece of cake. Interstate removals are definitely something everyone trying to move should look into – Melbourne to Brisbane interstate Backloading is only one of the many such routes our fleet of trucks take across Australia. 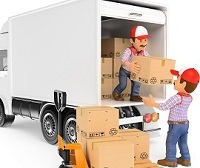 Melbourne to Brisbane removals done by expert Melbourne to Brisbane backloading removalists. With over 18 years experienced handling furniture goods from Melbourne to Brisbane. The Backloading Company offer an affordable Melbourne to Brisbane interstate removal service of all shapes and sizes. A removal of this distance can be costly. That is why backloading removals is an affordable and reliable way to transport your home of office furniture. Considering that your goods will either travel from Victoria through New South Wales and into Queensland. The distance is quite far. The Backloading Company offer removals from Melbourne to Brisbane where you only pay for space your goods require on a truck traveling in the direction of your move. You still get a door to door pickup and delivery service using experienced and trained Melbourne to Brisbane removalists that will pack, wrap and stack your furniture goods on a truck for a safe and secure transportation of goods. We use very big trucks – B-Double to be specific – to provide our Backloading services. In such a way, we can offer very competitive rates because the capacity of big trucks is substantial. What is more we can move anything from small bins to big pianos because with the space that is available. Being a professional company we are determined to bring your goods from Melbourne to Brisbane to another without damaging your goods. We are currently expanding and Melbourne to Brisbane interstate Backloading is not the only track we cover – we are in business of covering major town and cities in between as well. In order to provide you with additional security we also offer insurance options that will help you rest assured that your goods are covered on an individual level. We deliver with great care and precision and quickly becoming the interstate removal authority in the industry. On the other hand, besides the listed services we also offer pre-packing service. In such a way, you can leave everything connected with the Backloading to the experts who do this kind of business on a daily basis – and in turn you can focus on more important things knowing full well we will deliver in time.